I grew up in Bulan but I have never been in barangay Inararan yet, and perhaps I’ll never be there since I’m hearing news that its bridge is missing! The Inararan folks are complaining about the missing bridge for a quite a time already. But now they suspect, this bridge will soon be within Giming De Castros’ property. Again? They said that, at the beginning, they were told by the De Castro administration that there were no funds to replace the damaged bridge. And lately they heard that funds are there but now Giming De Castro plans to build the bridge no longer in the original place but over his own fish ponds. This to the frustration and indignation of the Inararan people. The De Castros have a history of using public money to develop their own properties. One case is the Bulan Central Bus Terminal in Fabrica, built with government loans on their donated one hectare piece of land with the option of re-acquiring the said land donation in case the Terminal failed to function as such and /or generate income. The second case is the Bulan Eco-Park in Calomagon where they used public funds for its development, each single tree planted in their property in Calomagon was acquired with people’s money. Students, teachers, volunteers and school children helped in planting the trees there and in many other kinds of labor for that Eco-Park. All free labors. “And who will earn the fruits in the future?”, a concerned friend from Bulan once asked me. Now the Inararan Bridge! What comes next? The new cemetery of Bulan??? Grotesque-sounding achievements of our local dynasty: The De Castro Bus Terminal, the De Castro Eco – Park, the De Castro Bridge in Inararan and perhaps next to it the De Castro New Cemetery of Bulan, all bearing their name but financed by the people. The De Castros wish to be remembered by the people of Bulan as philanthropists. But if they use this term just to trick the people and to advance themselves materially, I think the right term for that is opportunism because of using public office to their advantage. The people of Bulan deserve a serious and corruption-free local government! We now ask the people of barangay Inararan to update the world on this issue. Send us your opinions, photos or any material about this missing Bridge of Inararan. Palawan has 17 key bio diversity sites – which means it is part of the 70% bio diversity sites which are essential for sustaining life in the planet. It has 2 world heritage sites, 8 protected sites. Yet if you see Palawan on the map you will note that it is a very thin island – which is 82% mountain. It means that if the forest gets denuded and the minerals excavated – the tailings seep directly into the sea affecting the coral reefs. The top soil is thin – and the island eco system is fragile. Mining is not the way to go for Palawan. I have five eco tourism sites wherein the communities involved can now send their children to school, can dream bigger dreams. Mayor Hagedorn in Puerto Princesa has banned mining and logging – and focused on tourism and agriculture. From 2 flights a week, Puerto Princesa now boasts 10 flights a day. His revenues have gone up from several million to several billion. Please please support the ten million signature campaign to Stop Mining in Palawan. 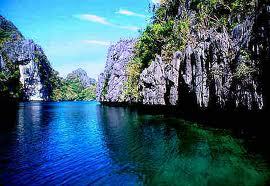 The richness of Palawan is the wealth and pride of the country, it is the wealth of the world. Log in to www.no2mininginpalawan.com .. register your vote and please please send it to thousands others. You can also include your household by downloading the form printing it – and faxing it t 4152227 or you can scan it and send it to signatures@no2mininginpalawan.com. Questions can be sent to signatures@no2mininginpalawan.com. Palawan contains part of the 70% biodiversity in the planet. It has 17 key biodiversity areas, 2 world heritage sites and 8 protected sites. Its topsoil is thin and island eco system is fragile. There are currently 354 mining applications in Palawan. Mining in Palawan is a myopic, archaic view of economic development. Register at http://www.no2mininginpalawan.com / and vote NO TO MINING. Carpetbaggers Back Off My Boyhood Town! C HICAGO (jGLi) – When I was a young boy vacationing in the native town of my mother, Consolacion G. Garra, in Matnog, Sorsogon, Luzon’s gateway to Southern Philippines, I always wondered why its white beaches had sprinklings of black sands. It turned out those black sands are called “margahas,” which I later came to know as magnetite sands. With no money to buy toys, we used these margahas to entertain us. We would put a trickle of these black sands on top of a small piece of grade school pad paper and put a magnet or magnetite stone (bato balani) below the paper and we would run the magnet in different directions. Because the margahas is attracted to the magnets, these black sands would stand up on end, like soldiers, if we moved the magnet or bato balani below the paper. The margahas would follow the magnet like dutiful soldiers. And it gave us a kick because it put matters under our control. I had no idea that these margahas and bato balani abundant in Matnog and the whole of the Bicol region were iron oxide minerals that are often mined as an ore or iron. It is commonly used as abrasive in water jet cutting, as toner in electrophotography and as micronutrient in fertilizers, as pigments in paint, etc. These magnetic minerals attracted nationwide attention in November 2005 when two sacks of dead fishes were allegedly buried in Barangay Binosawan in Rapu-Rapu, an island town of Sorsogon’s neighboring province of Albay to the north. For these margahas and bato balani to be of commercial use, they have to be mined. During their mining, they would give off toxic discharges, like cyanide, that emptied into Albay Gulf and into the Pacific Ocean that flowed south to neighboring towns of Prieto Diaz, Gubat, Barcelona, Bulusan and Bacon (now part of the capitol town of Sorsogon City), all in Sorsogon province. 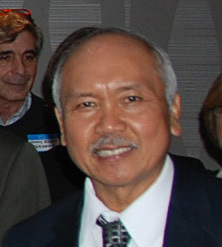 The cyanide poisoning caused massive fish kills in the area prompting President Gloria Macapagal Arroyo to create the Presidential Rapu Rapu Fact Finding Commission Report, and a separate DENR (Department of Environment and Natural Resources) Assessment of the Rapu Rapu Polymetallic Project, both in 2006. In one of then-President Arroyo’s rare shining moments, she approved the Commission’s report to junk the “$45-million in capital investments from Lafayette, Philippines, Inc. (LPI) of Australia, as well as $10-million investments from LG Group of Korea” that were jointly mining in Rapu Rapu. Ms. Arroyo learned that LPI’s Country Manager Mr. Roderick Watt “inadvertently stated in his letter” to her that LPI’s PEZA (Philippine Economic Zone Authority) application did not need the Mayor’s (Rapu Rapu’s) concurrence. More damaging, however, was the forgery of Rapu Rapu Sangguniang Bayan Secretary’s signature in the SB resolution that granted “ecozone” permit to LPI for tax-exemption. As a PEZA registrant, LPI certified that it would not endanger public safety or public health or violate anti-pollution requirements by installing pollution-control devices. As a result of the fish kills, the National Economic Development Authority recommended the LPI’s “tax-free status” revoked. While the DENR ordered the Bureau of Internal Revenue to investigate possible tax fraud as a mere two percent was paid in excise tax for the year 2005 for PhP 2,065,511.54, out of the $2.4-million ore exported. I wonder if my friend, Sorsogon Gov. Raul R. Lee, ever read these reports. 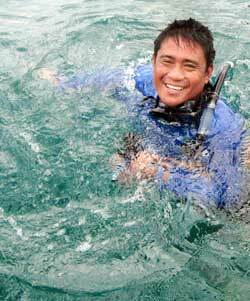 He was quoted in the report as saying that in Sorsogon, the fish scare caused “unwarranted and untold sufferings” to fisher folk families, fish traders and the fish consuming public. Did the good governor ever sue the LPI for damages to assuage the “unwarranted and untold sufferings” of his constituents? A registered mail sent me by Gov. Lee justifies the approval of a similar small-scale mining operation, like Rapu-Rapu’s, in a small barangay of Balocawe in Matnog consisting of 19,848 hectares. Writer’s Note: Rapu-Rapu’s mining operation covers only 5,218 hectares and was able to extract 67,693 metric tons of gold ore mined in 2005 and exported $2.4-million worth of ore. Governor Lee was prodded to send me a letter after I e-mailed DENR Secretary Ramon J. Paje that he should listen to the petition of “Save Matnog, Stop The Iron Project.” Secretary Paje, in turn, forwarded my e-mail to Regional Director Reynulfo A. Juan of Mines and Geo-Sciences Bureau in Bicol. Mr. Juan sent me a registered mail, informing Governor Lee about my complaint. In his letter to the Governor, Director Juan said, “(M)ay we recommend that the Provincial Government conduct the necessary validation on the issues being raised and to inform Mr. Lariosa directly on the actions taken by your office”? Mr. Governor, the permit was issued in August 2009, three years after the scathing Commission Report. My question to you is this: Did you get an assurance that remedial measures have now been undertaken since the Commission’s report in 2006 that indicted the “DENR, its bureaus (i.e. MGB (Mines and Geo-Sciences) and EMB (Environmental Management Bureau), its regional offices, including its monitoring team, (as) to be so dysfunctional as to be unable to prevent the occurrence of the October (fish-kill) incidents? They simply did not have the sufficient capability of monitoring mining operations in Rapu-Rapu. Worse, though, is that if they had the capability, then they utterly lacked (the) will”? Does the mining permit holder have the LFI’s and LG’s of Korea combined resources in capital investment of $55-million to operate a much-bigger “small mining” operation that will ensure the public safety or ensure public health and not violate anti-pollution requirements by installing “control devices”? If so, who are his business partners? In the event of a disaster, like a massive fish kills, or loss of the threatened Philippine Eagle owl (Bubo, Philippines), whose nest will be displaced by the clearing of the biodiversity area and occurrence of mudslides, is the permit holder capable of buying disaster insurance from Lloyds of London to appropriately compensate future victims, who in your words, may run into “unwarranted and untold sufferings”? If you can answer, “yes” to all these questions, I will be behind this permit holder. Meanwhile, I am appealing to President Noynoy Aquino and the Commission on Appointments to keep and confirm Mr. Paje as DENR Secretary and keep or promote Director Juan just for responding to my e-mail. Any other Cabinet Secretary or Bureau Director would have just deleted my e-mail complaint from their junk e-mails.